US interest rates fell and risky assets rallied last week in the wake of very dovish commentary from the US Federal Reserve after the January meeting of the FMOC (Federal Open Market Committee). Policymakers seemed to go out of their way to reverse course after sending a more hawkish-than-intended signal to markets after their last meeting in mid-December, which was followed by a slide in stocks and a spike in credit spreads. The Fed indicated that its next move could be either a hike or a cut, a shift from signaling further hikes in each of its policy statements for the past several years. Fed chairman Jerome Powell said that the case for additional interest rate hikes had weakened in recent weeks while downplaying the likelihood of a significant uptick in inflation. The central bank further indicated that it is likely to maintain a larger balance sheet than it had planned, with the runoff of assets projected to end early this fall at a terminal size of around USD 3.5 trillion, a much higher level than markets expected when the runoff began. Nonfarm payrolls surged in January as the United States added 304,000 jobs compared with expectations of a 170,000 rise. On the flip side, December’s extraordinary jump was revised down by 90,000 jobs. November’s total was revised higher by 20,000. This month’s rise in payrolls was the 100th straight month of gains. Also in the payroll report was the news that the unemployment rate had ticked up to 4%, partially as a result of the US government shutdown, according to the US Department of Labor, while average hourly earnings rose 3.2% year-on-year. The Institute for Supply Management (ISM) released its fresh survey data for January. The ISM manufacturing index rebounded to 56.6 in January, after posting its largest monthly decline since 2008 in December. While this rebound likely has allied fears of a rapid deterioration in the factory sector, the road for the manufacturing sector ahead remains a bumpy one. Based off of what has already transpired, Various estimates suggest that the shutdown has shaved between 0.2% to 0.4% points off first quarter GDP growth, which is tracking 1.6% (annualised). While most of the lost economic activity will be recouped in the following quarter, some of the loss will be permanent. Stocks rose for the week, lifted by gains on Wednesday and Thursday. Trading volumes picked up later in the week with the release of important economic and earnings reports and in reaction to the Federal Reserve’s two-day monetary policy meeting, which concluded on Wednesday. Volatility continued its recent downward trend, with the Cboe Volatility Index (VIX) touching a nearly two-month low on Thursday. Communication services shares fared best within the S&P 500 Index, helped by a sharp rise in Facebook after the company reported better-than-expected fourth-quarter earnings. Stability in reported user engagement despite recent social media controversies also encouraged investors. A revenues beat by broadband provider Charter Communications provided a further lift to the sector. Energy and industrials shares also performed well, with the latter helped by better-than-expected revenues from General Electric. A drop in longer-term bond yields weighed on the financial services sector by threatening bank lending margins. Fourth-quarter earnings releases drove much of the market’s trading, with 117 companies within the S&P 500 reporting results. Stocks fell Monday after disappointing results from NVIDIA, a maker of graphics chips used in gaming and artificial intelligence, and Caterpillar, the heavy equipment exporter whose fortunes are tied closely to global economic conditions. Stocks regained momentum at midweek, however, after Apple reported a slight gain in earnings and a smaller drop in revenue than many had feared given recent press over falling iPhone sales. Facebook’s gains also helped lift the major indexes, but results were mixed for Amazon.com and Microsoft. The Fed’s dovish stance helped encourage a decline in longer-term bond yields, with the yield on the benchmark 10-year Treasury note falling to its lowest level in nearly a month on Thursday before rising somewhat following the strong jobs report on Friday. Municipal bonds continued to see light trading as new supply remained underwhelming. Trading activity picked up slightly as the week progressed, as positive cash flows and attractive yields relative to Treasuries helped spur some positive performance. In the US, the flow of economic data releases begins again after postponements due to the shutdown. That said, there is no complete overview of which data will be made available. One important report is the trade data for November, which is due out on Wednesday. Besides official data, there is a strong interest for the ISM non-manufacturing index that is due out on Tuesday. A series of votes undertaken in the British Parliament last week gave Prime Minister Theresa May a mandate to seek modifications to the withdrawal agreement between the United Kingdom and the European Union. The most contentious issue remains the so-called “Irish backstop,” which potentially locks the UK into a customs union with the EU until a system is put in place to allow customs checks along the border between Ireland and Northern Ireland. EU officials immediately said the EU will not renegotiate the withdrawal agreement. In the near term, observers increasingly expect the UK to ask for an extension of Article 50 from the EU, a request that will likely be granted, as neither side wants a no-deal Brexit. British factories stockpiled goods in January at the fastest rate since records began in the early 1990s as they braced for a potentially chaotic Brexit in less than two months’ time. The IHS Markit/CIPS UK Manufacturing Purchasing Managers’ Index (PMI) also showed deepening pessimism across the sector that saw output grow by the smallest amount since July 2016. British consumers remained their gloomiest in five-and-a-half years this month as a small improvement in their personal finances offset growing concern about the outlook for the next 12 months, when Britain is due to leave the European Union. The GfK consumer confidence index held at -14 in January, its lowest since July 2013. Economists taking part in a Reuters poll had expected a slight fall to -15. 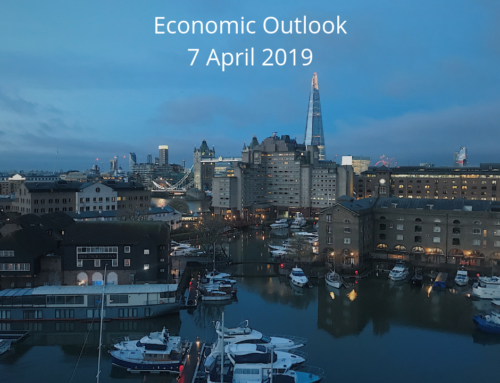 Businesses also gave a sobering outlook in surveys published on Thursday by the Confederation of British Industry and Lloyds Bank. The Bank of England is not expected to change its policy on Thursday. It is “Super Thursday” so an updated Inflation Report including updated projections will be made available. It seems likely the growth and inflation paths will be revised down. The next hike is expected to arrive in November instead of May. Amid falling demand for German exports, German economy minister Peter Altmaier has called for €10 billion in new measures to stimulate Germany’s economy. The package includes incentives for corporate investment and tax deductions for investments in energy efficiency for households and businesses. These measures may only be a start, as Chancellor Angela Merkel is discussing a sweeping cut in corporate taxes, taking the rate down from above 30.0% today to 25.0%, in order to counter the recent economic slowdown. Germany is positioned well to carry out fiscal stimulus given its budget and current account surpluses. Italy’s stocks declined more than 1.5% as preliminary data showed the country’s economy fell into a technical recession in the last half of 2018. Goss domestic product contracted by 0.2% – more than consensus estimates – in the last three months of 2018, following a 0.1% drop in the third quarter. This is the third time in a decade that Italy has fallen into recession, and the decline comes after a sharp increase in government borrowing costs and political uncertainty driven by the euro-skeptic government’s standoff with the EU over its budget plans. IHS Markit’s purchasing managers’ index (PMI) for manufacturing dropped more than expected to 47.8 in January – signaling the sharpest deterioration in Italy’s manufacturing sector since 2013. The eurozone preliminary real GDP for Q4 was stable, at 0.2% quarter-on-quarter, as expected. Hence, annual growth ended at 1.8% (seasonally adjusted) in 2019, stressing the fact that growth peaked in 2017 (at 2.4%) and that a slowdown is now taking hold. This said, it is likely there will be a less pronounced slowdown this year. Several signs so far in 2019 suggest that GDP growth should not be expected to improve much in the beginning of 2019; sentiment barometers especially have continued to decrease, pointing to only modest growth. As a consequence of that and slow growth at the end of 2018. There are no market movers in the EU this week. Trade negotiators from the US and China met in Washington last week, but no breakthroughs were achieved. However, the stage was set for a meeting between Chinese president Xi Jinping and US president Donald Trump in late February, at which Trump indicated the leaders may be able to forge a comprehensive agreement. Trump also suggested that the talks may need to be extended past the 1 March deadline the US imposed at the outset of the negotiations. Confidence among Chinese manufacturers as measured by the manufacturing PMI from Markit nosedived from 49.7 in December to only 48.3 in January, the lowest since February 2016. By moving further into contractionary territory, the PMI strongly indicates that recent stimulus has not been enough to halt the growth slowdown. The authorities often announce stimulus measures right after weak economic key figures have been released. Note, however, that the authorities prefer their own PMI gauge, the official PMI, which has a higher representation of the bigger, state-owned and less export-oriented firms. This measure increased slightly in January to 49.5 from 49.4 in December, maybe because the bigger firms to a larger extent are helped by the already announced monetary stimulus. Chinese stocks gained as hopes for a possible trade deal with the U.S. offset concerns over an influential private manufacturing gauge that fell to its worst reading since 2016, the latest evidence of the country’s deepening growth slowdown. For the week, the Shanghai Composite Index edged up 0.6% and the large-cap CSI 300 Index, China’s blue chip benchmark, climbed almost 2.0%. Both gauges rallied more than 1.0% on Friday, the last day of trading before mainland markets close for a week-long holiday for the Chinese New Year. There are no market movers this week in China (Chinese New Year and Spring Festival). Sources: Wells Fargo, T. Rowe Price, Reuters, MFS Investment Management, Danske Bank, TD Economics.